When the Jays shipped Brad Lincoln back off to the NL to the Pirates for Erik Kratz and Rob Rasmussen, it was viewed just as a depth move, but it could be much more. 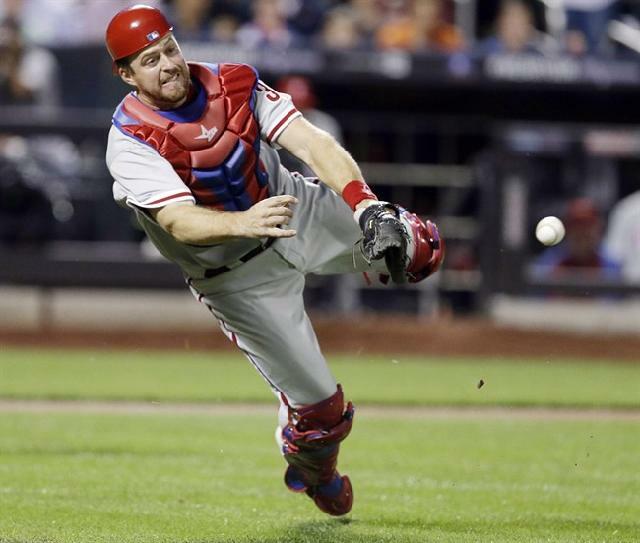 Erik Kratz is an elite defensive catcher and may turn that trade into a highway robbery. Kratz is a 6’4″, 33 year old journeyman who went through the Jays system as a prospect. He’s been given just 417 PA at the MLB level by the Phillies and has a career 82 wRC+. What makes Kratz so special? He is an elite receiver. A recent groundbreaking study by Harry Palvidis and Dan Brooks (of Brooks Baseball) sheds a ton of light on framing in the major leagues. Who’s the best? How much impact can there be? I highly recommend reading the study, you will be blown away. The results of the study can be found on player cards on both Baseball Prospectus and Brooks Baseball, while you can find a leaderboard on BP. Checking out Erik Kratz, he has had 5642 chances to frame pitches (a decent sample size) and he has saved a staggering 16.6 runs! That’s worth 1.8 wins! Add that on to his current 1.8 WAR in 417 PA and he’s already put up 3.6 WAR in less than a season’s worth of playing time. If you think that is amazing, just wait. The study also used a similar system to look at blocking pitches. Fangraphs already has a basic system that has Kratz at 2.2 runs from blocking, but the study (with a much more thorough system) has Kratz at 7.1 runs. Add that in and Kratz is now at 4.1 WAR in just 417 PA! How do the other Jays catchers compare in the way of framing? The study puts framing into a rate per 7000 chances (which is about one full season worth) so let’s look at that. Kratz is at 20.6 runs/7000, Thole is at 6.4 runs/7000 in his career and finally Navarro at -8.6 runs/7000. Doesn’t look so good for Navarro, but if you look closer you would see that the bad stuff is mainly coming from 2008 where he lost 23.6 runs due to his framing. He was also sub par in 2009. Since 2010, however, Navarro has been around 0.4 runs/7000 chances. Using these numbers (Navarro since 2010), Kratz is 2.2 wins better than Navarro over a full season and 1.5 wins better than Thole. How do these guys look over 600 PA based on the 5 projection systems that are available (Steamer, ZiPS, FANS, Oliver, CC). With framing, Kratz has a 1.7 WAR lead on Navarro over a full season. 4.7 WAR is an amazing projection for a guy that is supposed to be a backup catcher. That’s equivalent to Freddie Freeman’s year last year or the Steamer projection of Dustin Pedroia. Maybe you are skeptical of the impact of framing, and maybe you want to cut the impact of framing in half (I wouldn’t). That would still leave Kratz at a projected 3.6 WAR over 600 PA compared to Navarro at 3.0. Maybe you’re skeptical of the study itself? We can look at the next best publicly information we have, StatCorner. With StatCorner’s numbers, Kratz has saved 17.9 runs in his career, which is even higher than BP’s 16.6. Navarro’s numbers are similar as well at -20.8 runs on StatCorner compared to -27.6 runs at BP. Comparing the two methods, StatCorner just determines if the pitch was in a predetermined strike zone that umpires appear to call and assigns added and lost strikes. BP uses a mesh probability system (probability of any given pitch being called a strike) and adjusts for pitcher, type of pitch, and umpire. I’ll let you decide which study you want to trust more. Maybe Kratz doesn’t perform to his career numbers, maybe he regresses down to around 0.5 wins with framing per season. That still puts him on par with Navarro over a full season. There is definitely a case for having Kratz be the full time catcher with the framing upside. We all know this won’t happen however. A lot of people won’t trust the results, but I still want Kratz in there as much as possible. Lind is still looking for a platoon partner, so what about a platoon of Navarro/Kratz? It would not be a typical platoon as Navarro would be DHing while Kratz is behind the plate. Currently the (shaky) plan is to use Moises Sierra to platoon with Lind. Let’s break down the projected and regressed splits of Lind, Sierra, Kratz, and Navarro using Nik’s regressed platoon splits. As you should notice, there is not a projected difference between Kratz and Sierra against left handers. So how much do we gain by platooning Kratz with Lind instead of Sierra? Last year, 27% of the pitches the Jays faced were against left handers. This would allow Kratz to save approximately 6 extra runs with his framing over Sierra in platoon situations, or 0.65 Wins. Unrelated to Kratz, but when Dickey faces off against lefties, Navarro is the clear option to platoon with Lind in the DH spot either way (like in the season opener vs. Price for example). 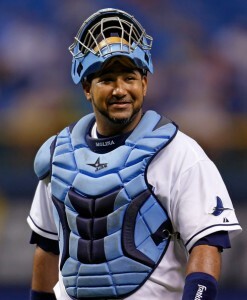 The idea of having both catchers in the game does not leave a catcher on the bench and some may view this as taboo. I don’t see it as an issue however, because in the (very) slight chance Kratz gets hurt, Navarro can enter into the game from DH and Lind (or anyone else on the bench) can pinch hit for the pitcher when they come up. It’s an unlikely scenario that does not have much effect on the game. This is likely the best usage of the assets (aside from Kratz full time and Navarro being the backup C and platoon hitter) that maximizes the runs scored and prevented. Pitch framing is still a market inefficiency and Anthopolous (whether knowingly or not) took advantage of it when he made this deal with Amaro. Kratz has the ability to make the pitching staff look very good while not taking much of the credit himself (just like Jose Molina in Tampa). Yan Gomes (19.6), Martin Maldonado (19.0), Russell Martin (17.2), and Buster Posey (16.2) follow, before a drop off in talent. It may be disturbing to Jays fans that the Yankees and Rays each have two of the top seven framers, while the Red Sox have one. If you don’t buy into the impact of framing, just think of how many pitches the catchers have an impact on. They can attempt to frame roughly 7000 pitches in a season. Last year’s leader in pitches was Justin Verlander at 3692 and the top batter was Joey Votto at 3033 pitches. Now the max value that the catcher can milk out of a received pitch is a lot less than a pitcher or batter, but when you think about how many chances to make an impact the catcher has, it makes sense that the impact is so large. Just changing a walk to a strikeout (on a 3-2 pitch) is worth 0.59 runs. It does’t seem fair that the catcher has the most facets of the game to provide runs in, but that’s the way it works. If you take a look at my projections you’ll find Posey, McCann, and Lucroy in the top 15 players, Russell Martin and Yadier Molina in the top 30, and Miguel Montero, Yasmani Grandal, and Yan Gomes in the top 50. 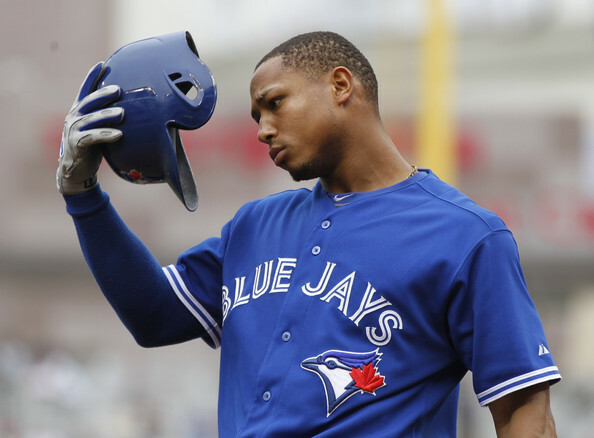 The potential impact of framing may also give more stock to the prospect status of A.J. Jimenez. Many reports have suggested that he is a very good receiver, and the impact of receiving may be undervalued in the game today. It is time to start giving catchers with good framing and blocking the credit they deserve. Personally I would have just went with – The Case for Kratz – He hit two oppo tacos in todays ST game, but your way works too.